Zac has been busted several times this week, mostly related to school activities. First of all he announced that he was now getting off the bus at his friend’s bus stop in Whaley Bridge, and then walking back to boost his fitness. Eyebrows were naturally raised, but the act was applauded, until…it was discovered that his reward for the extra half mile walk was a giant bag of mini cheddars that he picked up at Cloud Wine. Next it was the school bus after they returned from a football match in Tupton. The team were in high spirits, despite losing 6-0, and Zac threw a bandage at his pal. He then unfastened his seat belt, probably so that he could see what was going on behind him, but he was caught red handed, told off in no uncertain terms, and then made to tidy the bus after everyone else had got off. Inside school it didn’t get any better, with giggles turning into uncontrolled laughter in the drama class. The teacher told him that she would ring his parents and tell them what he had done, but he didn’t seem too concerned about it when he got home, and the phone hasn’t rung. It can be a confusing and challenging time for an 11 year old new into High School, and there were more giggles when he announced that he had been learning about dildos at school. I thought this was perhaps a bit experimental for year 7 pupils, and then he remembered that it wasn’t dildos, it was condoms. Hmmm, lets hope that is the only time he ever makes that particular mistake. Those of you who know him will realise that Zac’s diet is a perennial concern. He has fruit and toast for breakfast and supper, with more fruit included in his lunch. The breakfast and supper fruit is often left, or just picked at, so there really is not much hope for his lunchtime portion, but after several weeks nothing seemed to be coming back from school uneaten. Then I emptied his school bag. Little parcels of apple in various stages of decay were emptied out, alongside slippery grapes that were long past their sell by date, and at least one item that was unidentifiable was an ex piece of food. The latest sanction is to insist that he finishes his fruit before he gets any toast, but I suspect that won’t last very long. My knee continues to improve, with plenty of cycling, but swimming is a step too far. My physio is very pleased with the progress, except for the joint effusion that doesn’t seem to be reducing. I go back to the consultant on Monday to find out what he actually found three weeks ago, and hopefully to discuss the long term plan. Grandfatherly update – Gabi has now been given the date of 23rd October for her induction, which means we will probably be mid Atlantic en route to Orlando when she is born. Its getting very close to the festive season, and it will soon be time to organise our annual jaunt into the City. For quite some time we have had the Christmas markets as our focal point, but they have been getting worse every year. They are just a bit too much of an excuse to exploit the mood of the population, with overpriced food and drink served occasionally by a German Fraulein, but more often by a lass from Salford. Maybe we will take a tip from the Three Wise Men from the east and have a curry instead. Zac’s birthday is tomorrow, but of course his school friends don’t really care when the actual day is, as long as there is a party. This year it was a trip to Jump Nation for Zac and six of his mates, and they had a great time pretending to be Tigger on a variety of trampolines. Back at home there was the watermelon challenge. This involves wrapping lots and lots of elastic bands around a watermelon until it bursts. It actually takes a long time and an awful lot of bands. I did the first 150, and the melon was showing the faintest signs of buckling, so I handed it over to the boys. Five minutes later it had indeed exploded, but only because they had thrown it in the air. When it hit the ground the pressure of the bands was brought to bear, and the red flesh was hurled into the air. Great fun, and something that could well be repeated with one of the supersize watermelons in Florida. Seven boys is a bit of a logistical problem when they are all sleeping over, and we had to rustle up a number of mattresses so that they could all sleep in the lounge. I balanced one of these over the bannister, steadied it onto the stairs, then let it lean. Unfortunately, it leaned a bit too far, took a sharp right turn and knocked over a decanter of sherry and several antique sherry glasses. Sally was most upset, mainly at the loss of the glasses. Not because she had nothing else to put her sherry in, sherry glasses tend to be too small for that, but because they were her mother’s. Anyway, it looks like we may be able to replace the glasses on eBay, and the sherry at Tesco. The decanter remained unscathed. 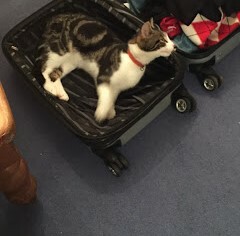 Packing for holidays is always a fun time, but we will have to watch out for Sapphire. I think he fancies coming with us. Its been a busy time in the kitchen, but one recipe that I have not yet had time to try is Chocolate Lasagne. I will let you know when I get around to it – perhaps you would like to come round and try it?! I have been experimenting with cereal bars, and came up with a good combination of almond butter, honey, oats, hazelnuts, almonds, various seeds and cocoa. Whoever said that cereal bars were healthy is perhaps stretching it a bait, but they can address a hunger pang to get you through the day. Ole tried most of the varieties that I came up with, commenting that he actually liked the taste of these, but then he admitted that he doesn’t really like nuts. He could have said this in the first place and saved me a lot of time and effort! And he doesn’t seem to mind the nuts that are in the tub of Nutella that he regularly trashes. Anyway, speaking of time and effort I have decided to give Heston Blumenthal’s burger recipe a go. A mixture of chuck, short rib and brisket that is given a combination of two grinds. Sourcing the meat, and a few other things, confirmed that MacBurnhams butchers in Chapel is a much better option than the butcher in Whaley. The chuck is salted first whilst the other two meats are ground, Then all three are ground together. The grind has to be given special attention to ensure that the mince all flows in the same direction. I have to say they tasted delicious, the complexities of the grind really did make a difference, but it is a lengthy process! And because of the varieties of meat I have ended up making far too much. Fortunately Hell Dog was on hand to assist in the consumption. The process gives you a long patty that you can slice into burger sized patties as and when you require. It is molded in clingfilm, so I think it should freeze quite well, or maybe we’ll just have burgers tomorrow too! You may remember that some time ago I bought a white car. Well, white cars show up the dirt very well, and as I had not been near a car wash for a while I decided to wash it today. I used to do this regularly for my dad when I was a kid. A bucket of soapy water and a sponge – soon be done. But no. Apparently soapy water and sponges should not be used on cars. They damage the paintwork. Or so said Sally. I wonder if they have the same affect on glass? Must ask the window cleaner. Anyway, I continued, and after twenty minutes or so it looked cleaner with no discernible damage to the exterior. Sally continue to chastise. “You spend 20 grand on a car and then you ruin it.” I thought that was a bit harsh, and I could have replied with, “You habitually spend over 45 grand on a car and have proceeded to reverse into a post, my mate’s car and a wall, as well as hitting a stationery JCB coming in the opposite direction.” But I didn’t. I’m better than that!